Bracket formats will be double elimination when we have 8 or 16 teams in a bracket. We will use Pool Play & Seed format if a bracket doesn’t have 8 or 16 teams. – Teams competing in tournaments 9U-12U will be subject to 6 innings or 1 hour and 45 minute time limit. In pool play, this will mark the completion of the game. On Sunday, if tied at the end of either, international tie break rules will be played until a winner emerges. – Teams competing in tournaments 13U-18U will be subject to 7 innings or 2 hour time limit. In pool play, this will mark the completion of the game. On Sunday, if tied at the end of either, international tie break rules will be played until a winner emerges. – International Rules means, last batted out becomes the runner on second with 1 out to start the inning. All other substitution rules remain in place as well as current batting order. – Championship game will not have a time limit; however, the Mercy Rule is in effect. No International rules unless umpire requires it to finish game due to Rain or darkness. – All 2 day weekend tournaments will have a 3 game minimum format. You will have the possibility of playing up to 5 games. 2 games will be played on Saturday and 1 game on Sunday in most cases. – Baseballs will be provided by SC Bulldogs Baseball. – Any discrepencies with regard to scoring will be resolved using the home team’s book. – In brackets with an uneven number of teams. The team that signed up first gets the bye in round one (if needed). – Awards will be presented to the championship and runner-up teams. General Fair Play/Sportsmanship Intentional disregard for the stated rules and obvious unsportsmanlike behavior will not be tolerated and will place the individuals and/ or teams involved at risk for banishment from any additional SC Bulldogs Baseball Tournaments. Teams 9U – 10U will compete on 46′-60′ dimensions. Rubber Cleats. Teams 11U – 12U will compete on 50′ – 70′ dimensions. Rubber cleats. Teams 13U – 18U will compete on 60′ – 90′ dimensions. Metal cleats allowed. We use April 30th as the age cut off. The player must be the age of his/her age bracket if birth date is before April 30th, 2017. i.e. If Bill is 9 years old before April 30, 2017 then he would be eligible to play 9U age group. If he turns 10 before April 30, 2017 he must play in the 10U age group. *All teams move “up” in their age group on September 1st, 2017. For example, the 10U team (all players) become and will compete against 11U teams on September 1st, 2017. Unless otherwise noted by a Tournament Director, no infield practice will be allowed prior to the start of any game. Teams will be permitted to take ground/fly balls down the outfield lines prior to the start of their game. Please remind your players and coaches NOT to use the infield prior to the game. Teams are not required to post their rosters on our website. However, we do require copies of birth certificates and proof of your team’s insurance with SC Bulldogs Baseball listed as an additionally insured on your team’s policy. ROSTERS: All team rosters are weekend to weekend rosters and may be changed from week to week at the discretion of the organization. Once a team has started a tournament, players may be added to their roster provided the player is of legal age (Legal Age is based on age as of April 30th) and has not played for another team of the same age bracket during said tournament. PENALTY: An ineligible player, due to roster rules, shall be removed from the game at the time of notification. There will be NO FORFEITS because of an ineligible player. A sub may replace the ineligible player if one is available, otherwise an automatic out will take place in the same manner as an injured player. No new players can be added to the roster once POOL PLAY has been completed. 9U-14U- 2 ¼ to 2 ¾ inches in diameter allowed with NO weight restrictions. 15U-18U- 2 ¼ to 2 ¾ inches in diameter allowed, -3 weight differential only. Intentional Walks – In an effort to waste less time, a hitter will be granted first base if the defensive team lets the Home Plate Umpire know that it is their desire to intentionally walk the batter. The pitcher doesn’t need to throw 4 pitches. Base On Balls – 9U/10U – There will be no advancing to second after a base on balls. Once player reaches first the play is dead until pitcher takes mound for next pitch. Protests: No protest will be allowed for judgment calls. Protests will be allowed for rules only and must be decided before restart of play. A $100.00 payment must accompany protest and will be returned if the protest is upheld. A Protest is only “official” if accompanied with a $100.00 fee and done before the next pitch. The same fee will apply for protests of age and Birth Certificates. The Burden of Proof will lie with the protesting coach. Pool Play Games- If the game is suspended prior to being official and there is not enough time to resume- the game would be considered complete at the end of the last complete inning. If the game is tied at the end of the last complete inning- the game would stand as a tie. Elimination Games- If one inning hasn’t been completed and the game is suspended and there is not enough time to resume- the higher seed would advance to the next round. If tied at the end of the last completed inning- the higher seed would advance. If tied at the end of the last complete inning and the two teams are the same seed from different divisions entering the game- we would revert back to the tie breaker system in place (Record, Runs Allowed, Runs Scored). If the Championship Game Starts and is not able to complete due to weather/ darkness and there is no time to resume- the game would be considered complete at the end of the last complete inning. If tied at the end of the last complete inning- (6/7 innings respectfully) International Rules will apply. The next inning will start with the visiting team leading off with the last batted out of the previous inning on second base with 1 out. The batting order remains the same and follows the last completed inning. Spring/ Fall Weekend Tournaments: 3 game minimum tournaments 1. Play 0 Games= Full Refund if called on Friday. $100.00 Per Team Admin fee if called Saturday. 2. Play 1 Game= Credit for 1 Free Entry (Good for 12 months) 3. Play 2 Games= No Refund. * If 1 pitch is thrown it is considered a game. A pitcher that is removed from the game may not return to the same game as a pitcher. 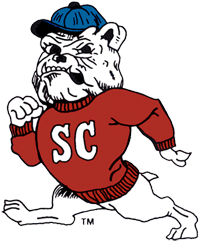 SC Bulldogs Baseball does NOT have a mandatory pitching limit on innings pitched. HOWEVER, please remember that you are responsible for these young men and the futures they may have. The act of faking a bunt, then pulling back and swinging will not be allowed in 8U, 9U 10U, 11U and 12U. The result of this act will be a dead ball and the batter being out. All Dugout selection is based upon a first come first serve basis; any disputes will be determined by the tournament director. Pitcher Re-Entry: If a pitcher is removed from the mound and goes to another defensive position, they may not return as a pitcher in that game. If a team substitutes for the pitcher when on offense, but then re-enters the pitcher before going out on defense, that pitcher is still the pitcher of record and can continue to pitch in the game. Time in-between innings: 2 Minute Rule! We expect teams will take no more than 2 minutes in-between innings. Pitchers are permitted 8 warm up pitches in their first inning of work or 5 warm up pitches every other inning that they pitch in that game. If a catcher needs to put gear on, another player/ coach in gear should be ready to warm up the pitcher. Mercy Rule * All ages are subject to a 15 after 3, 10 after 4, 8 after 5 innings run rule. Bunting/SLASH * All ages are permitted to bunt. No Slash Bunting (Butcher Boy) Bunting at 9U & 10U. Infield Fly * 8U, 9U & 10U NO Infield Fly Rule. 11U-18U are subject to the Infield Fly Rule. Walk * 8U, 9U & 10U Only one base will be awarded on a walk. Lineup Teams can bat 9 or the entire team. Once the lineup is set the integrity of the lineup must not be affected. Re-Entry * Starter may re-enter, in their original batting position, for all age divisions. Courtesy Runner * P & C at any time, optional with 1 or fewer outs. Game Play * A team may compete with no fewer than 9 players to constitute an official game. Ejections * Player/Coach/Fan must leave immediately to parking lot (IN CAR), Expulsion length will be left to the Tournament Director’s discretion. IF at any time a coach, fan, or player makes intentional contact with an umpire that individual’s tournament will be over (intent will be determined by the umpire and tournament director). Sliding * All ages are permitted to slide head first, at players own risk, and they must avoid contact! Appeal/Protest * There are NO appeals on judgment calls. $100 to Tournament Director for all other appeals. Must be made at time of protested ruling. You may not protest after the fact…must be made before the next pitch is thrown.